Hop on over to check out the blog hopping fun! It's been pretty hot this past month here in Vancouver. Hotter than we're used to, this time of year, and it looks like the summer is going to be a scorcher. So I'm so very happy we installed a heat pump a few years back. Air conditioning is such a luxury in this part of the world. Anyway, as far as my currently above, we've been really stressed out that my 80-ish aged Dad was going in for surgery last week, but it went well, and I think he's just thrilled to be alive! We've been visiting him in the hospital every day and looking forward to him coming home tomorrow. I'm thinking and worrying about my current job situation. We're currently on summer holidays, but yesterday the deadline passed for the government's offer and now it looks like we might not be back at work anytime soon. (ie; - not until October at least). Living in the most expensive city in Canada, means that we depend on our incomes, and the fact that I'm married to a teacher, makes this uncertainty doubly scary. But we'll see what happens right? So due to the stresses above, I could really use a visit to the spa but for today, perhaps a bubble bath with a glass of wine will do - I have air conditioning after all right? 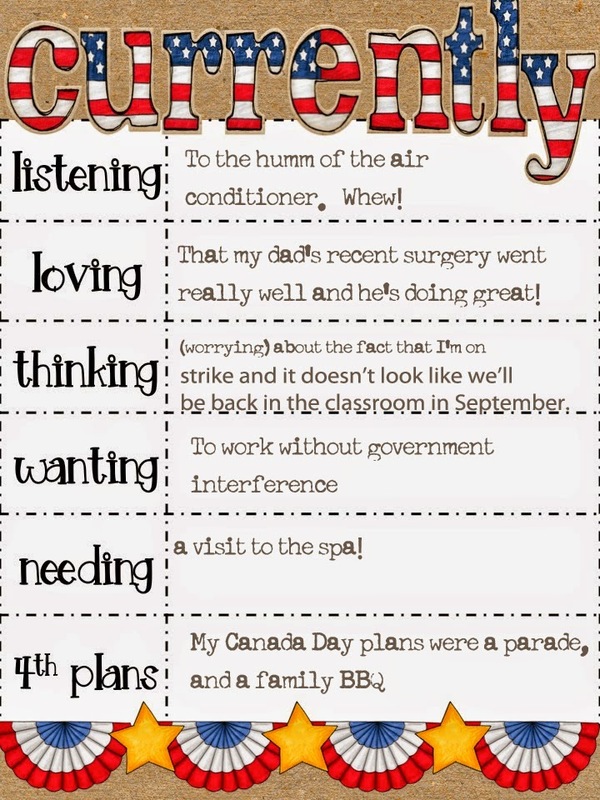 Today is July 1 - which is Canada Day. We went tot the parade this morning, just came back from a family BBQ at my Aunt's and are planning to go visit my Dad in the hospital this evening. July 4th is my Dad's 82nd birthday, so we will be having dinner with him hopefully! Hope your July starts off great ! Happy Canada Day!! Hope your Dad is feeling better soon and your job situation gets resolved. Our district is going thru negotiations right now and it's a scary, frustrating experience. Good luck!! Thanks for visiting my blog!! I am now following you on bloglovin! Hi Sandra! Enjoyed reading your currently. Sorry to hear about you not being back in the classroom in September. That must be so tough. Glad that your dad's surgery went well though! No matter what the surgery is, it's always a scary thing... especially on those we love. You definitely need/deserve a spa day girlfriend. :) Take care! Sandra, Thanks for stopping by my blog. I am now following you and look forward to keeping up with all that is going on, once the school year begins. Hi Sandra! Thanks for stopping by my blog and for your kind words. Do you know that you're a no-reply blogger so I can't respond to you via-email? Let me know if you want help changing that. Your blog is super cute too! I'm excited to explore. I'm glad that your dad is doing well but so sorry to hear about the current situation with your job. I can't imagine how that must feel. My husband and I are both teachers and we talk about that all of the time. Best of luck to you! Have a happy 4th. Hi Sandra. I'm sorry that you have to deal with so much stress during the summer. I have had to go through a summer not knowing if or where I would be teaching in the fall, so I feel your pain. It's so frustrating when politics interfere with education and the only people hurt are the teachers and kids. I'll keep my fingers crossed that things work out before September. Thanks for stopping by my blog!! I hope your dad recoveries quickly. Hi Sandra, thanks for stopping by my blog. I've heard a little bit about your strike from the TpT forums, but I don't know the specifics. From the little bit you've written about it, sounds like politicians are interfering in education there, too. I think it's going to take parents getting tired of what politicians are doing to the kids before the tide reverses around the world. Thanks for stopping by my blog! I'm your newest follower! I'm sorry to hear about your job situation. I hope everything gets figured out asap. I haven't heard about that so I'll have to do some research and get informed. Try to enjoy your summer (minus the heat)! I am sorry that your future is looking uncertain! :( I am really grateful for my air conditioner too! Great to "meet" you! Thanks so much for stopping by my brand-spanking new blog through Farley's July Currently. That was my first link up. I'm looking forward to linking up with others again soon. It was exciting because I've never done it before. I'm stepping out into the blogging world with 2 colleagues right now, but more have stated interest in joining the "Literacy Loving Gals". Yay! I really appreciate your very kind email. I've only been a blogger for about 10 hours now, but I'm enjoying every bit of it thus far. I just clicked on your "Follow on Bloglovin'" button, so I can hear from you regularly. I'm a fan of Bloglovin'. Anyway, thanks again and feel free to stop by Literacy Loving Gals as often as you'd like! I'd/we'd love the support. :) Also, good luck with your father. I know those situations can be scary. Stay positive! Praying for your dad's recovery and your being able to get back into the classroom sooner. Hope you get a spa day in soon! Thanks so much for visiting my blog!